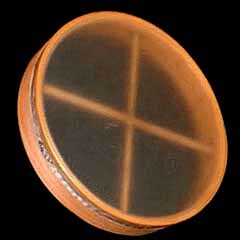 Traditionally an Irish frame drum played with a small double ended stick called a tipper. Traditional playing techniques involving the hands only do exist but are older and rarer. Also rare is to find the bodhrán with jingles attached, which can still be found today in some Irish pub music. The one pictured here is made by Cooperman Drums and is an over sized version at 22 inches with tuning hardware mounted in the back and a plastic head. These larger drums are made to be played specifically with innovative hand techniques.